We sometimes get asked the question as to whether it is possible to convert Gardiner Poles to a so called ‘hoseless’ or ‘tubeless’ setup. First of all what is this referring to? It does not actually mean that the pole is being used without hose (currently just not possible to get water to the brush head without hose!). It is referring to a system that allows the pole hose to be disconnected from the base of the pole so that the pole can be stored on its own and the pole hose can be stored separately or reeled back on to the hose reel with the reel hose. 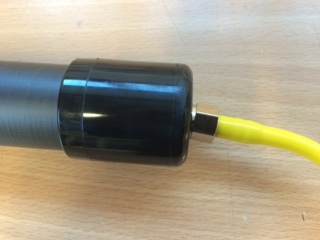 Sometimes users even use just the reel hose and this then goes up inside the pole during use. Are there any benefits to this? The benefit that some users like is that it allows their pole to store easily in the van without a coil of hose. The other benefit, depending on hoses used, is that no connectors are left trailing on the ground in use – this only applies if using the reel hose up inside the pole. Are there any downsides to this? The pole hose still has to be stored somewhere. If using the reel hose up inside the pole then this is a lot heavier than lightweight pole hose and can be really noticeable when working with an extended pole. So is it possible to convert a Gardiner Pole to a ‘hoseless’ or tubeless’ setup? Yes, it is. There are several aftermarket firms offering proprietary connector systems that allow conversion of our poles. Please be careful when fitting that no alterations are made to the pole material that would adversely affect the warranty. Is it possible to DIY convert a Gardiner Pole to a ‘hoseless’ setup? Yes, it is and several of our clients have been doing this for years and have even sent in their methods of doing so. 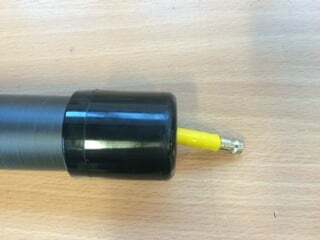 This involves leaving a short tail of pole hose sticking out of the base of the pole and then fitting a male connector such as a male EZ-Snap plug. Then the coil of pole hose that you are using can connect to the with a female coupling and the couplings and hose gets pulled up inside the pole during use. The photos below show how this looks. This is the simplest method and has been in use by some for many years. This is a more complex method. It uses all standard Gardiner supplied parts, apart from cheap John Guest plumbing inserts from B&Q. 11. Remove the end cap from your pole and cut out a much larger hole with a sharp knife. There needs to be enough of a lip for the cap to stay in position on the base - Excuse the very rough hole cutting! Why do Gardiner not sell this as an option on their poles? We do not feel that these systems offer enough real world benefit in use for the majority of our clients. As there are other aftermarket firms already offering this type of add-on we are happy to let clients source from these firms if required. What are the advantages of using a Water Fed Pole system? What WFP system choices do I have to make? What WFP pole choices will I need to make? What WFP equipment will I need for a DIY Set-up?